18mm Heart Pendant. 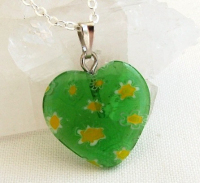 Millefiori Glass, green, yellow, white. Includes Silver Plated Chain (46cm, 51cm, 56cm or 61cm). A fun addition to your jewellery box! FREE UK delivery by Royal Mail 1st Class. Silver Plate Chain: please choose either 46cm (18"), 51cm (20"), 56cm (22") or 61cm (24") length.